Happy September, my friends! I love September and am looking forward to the cooler temperatures that allow me to sit on the porch and read. And I love watching the changing colors of the trees on my walks around my neighborhood. My plans for September also include some travel. In the middle of the month, we will be returning to Utah for the Celebration of Life for my mother. My brothers and I have been busy planning the details, and look forward to that beautiful September day when we all meet to celebrate the life of a remarkable woman. My reading plans include a long list of books for the Readers Imbibing Peril-#13 challenge and for The Classics Club. I will be rereading some old favorites, as well, and look forward to sharing all of this reading with you. Reading on the porch, taking long walks, enjoying a road trip with my husband, celebrating someone I love dearly…it sounds like a lovely September to me! 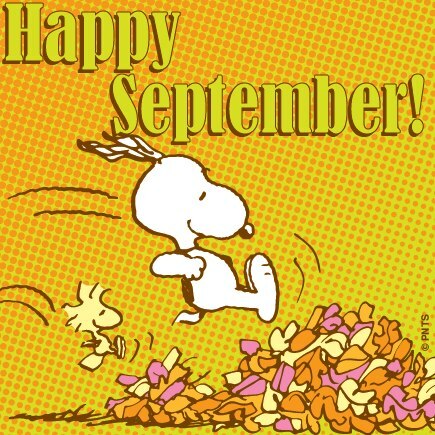 Wishing you a lovely September, too! This entry was posted in Mom, On reading, Thoughts on September 1, 2018 by Robin.